Hey guys, I need to replace the flexy disk between the drive shaft and the diff. Is there any differences between models/years?? (I’m very competent with mechanics). The 6 cylinder and v-8 models do use a different flex disc between the two. 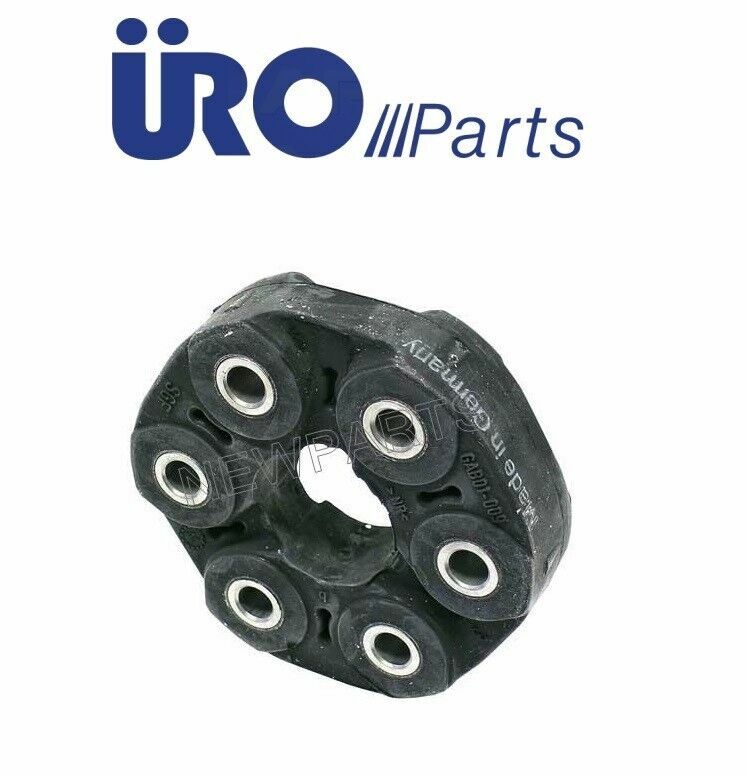 The one you need is part number 126-410-02-15. Try to stay clear of aftermarket flex discs. They cause vibrations at highway speeds and/or they fail prematurely. I've lived this hell on more than one occasion. If you're going to renew one flex disc you always renew the other at the same time You have a front one and a rear one. The job itself isn't hard, but it is time consuming. You'll have to remove the heat shield for the exhaust, and this may require lowering the exhaust a little. Pay particular attention to where and how the bolts and washers are orientated on the flex discs. Washers are ONLY allowed on the flex disc, never the three armed flanges. While the driveshaft is out you may as well renew the center support bushing and bearing, too. Before you separate the two halves of the driveshaft you must index the two halves. Otherwise it'll forever be out of balance and will vibrate, which will also damage the new flex discs prematurely. You'll also have to remove the rear cross member that the transmission sits on to gain access to the front flex disc. While this is off inspect your transmission mount and rear transmission seal. Renew both if necessary. This is also a good time to renew shift linkage bushings if they're bad or questionable. Try to stay clear of aftermarket flex discs. They cause vibrations at highway speeds and/or they fail prematurely. I've lived this hell on more than one occasion. Can't say for other brands, but at least in the case of the "genuine" MB part, Lemförder part and FEBI part it's the exact same thing you get in the box. There's exactly zero difference between the three, except for the "genuine" part carrying MB star and part number, while the other two don't. All three are not produced by either MB, Bilstein (owners of the FEBI brand) or ZF (owners of the Lemförder brand) anyway, but sourced from these guys: Süddeutsche Gelenkscheibenfabrik GmbH & Co KG, which have been supplying MB as an OEM under the Jurid brand for ages. Easy to tell too: look at the rubber on the flex disc. If it carries the distinct "SGF" marking, you can be sure it's no different form the OEM part in any way. Thanks for the awesome info guys, I’ve replaced the engine and trans mount 2 weeks ago but forgot to get the flexy disks while I was doing it. Will get it ordered and on ASAP had a drive this weekend and the vibration at speed was annoying the misses haha. Check your universal joints. If Guibo disks “Flexy disks” are OK, they are the next suspect. You're forgetting a very important fact, Lucas. Even though these places supplied the flex discs for Mercedes we have to remember that the ones made for Mercedes were made according to their specifications, while the ones offered by SGF and FEBI were made to a different standard (usually of a lesser standard). It makes no sense to offer the same part with or without a Mercedes part number, as doing so would have landed SGF and the like in copyright jail. They simply cannot make a part exactly the same even though the part number and Mercedes symbol isn't present. It has to be made differently somehow. It may be a softer/harder rubber, less string inside, a different type of string, etc. A perfect example is motor mounts. All kinds of aftermarket versions exist, and every one of them are different from the ones that Mercedes offers. Not so much in design or shape, but in material composition. Hence, the short life of many of them. I'm rather shocked that you, of all people, would promote an aftermarket part for something as important as a flex disc. A cheaply made flex disc that fails can cause mounds of damage and puts lives at risk. You're forgetting a very important fact, Lucas. Even though these places supplied the flex discs for Mercedes we have to remember that the ones made for Mercedes were made according to their specifications, while the ones offered by SGF and FEBI were made to a different standard (usually of a lesser standard). It makes no sense to offer the same part with or without a Mercedes part number, as doing so would have landed SGF and the like in copyright jail. Nothing becomes a fact, simply because the Internet said so a million times over. Talk to anyone in the automotive design industry about how they pick parts. Off-shelf is king. Regards to “fitting” the flexy disk on a w116. Is it simply a matter of unbolting the old, bang in the new and bolt up or is there more to it??? Do I have to drop the diff and driveshaft?? Has the driveshaft got an input shaft into the diff where the shaft needs to be removed from the diff to fit the disk?? You should plan on removing the entire drive shaft and replacing the flex discs as well as the center bearing and support. There is a small bushing on the center rear of the shaft also. The most annoying part of the job is removing the entire exhaust. You will need to support the rear of transmission and remove the support for it to access the front flex disc bolts. Good time to inspect/replace trans mount. Once the exhaust and heat shields are removed there are just a few bolts to remove the entire shaft. There is a locking nut near the front/middle of shaft that needs to be loosened it is fairly large 32 and 36mm or something that allows the shaft to lengthen or shorten that need to be released to help with room to remove the shaft. you are suppose to put rear wheels weight of car on ground before tightening these on assy. MARK the relationship between the front and rear section or you will need to have the entire shaft re-balanced. Use MB parts only, this is not an area to skimp. thanks everyone ill chime in laters if I get stuck.